Well after a few months poking around and a number of polls here on the TZ, my new watch arrived today. HOW DID I FINALLY DECIDE? I began my journey a few months back looking for my first gold watch. I was at both a point in my life and collecting knowledge, where I wanted to add a classically sized, rose gold watch with a timeless design aesthetic and a horologically innovative calibre finished at the highest level. I also wanted the piece to bring something new aside from its case material to my collection. I wanted a watch that was dressy, but also was appropriate for wear in normal day-to-day life amongst my rotation of watches. As usual, my search turned out to be highly educational journey that took me through about 90 watches made by multiple makers (AP, ALS, Blancpain, Breguet, Chopard, Chronoswiss, Dornblueth, FP Journe, GP, GO, IWC, JLC, JD, Moser, Omega, Parmigiani, Patek, UN, VC and Zenth) . I am fortunate to live near NYC where I was lucky to be able to see, feel and try on a piece which is invaluable when making a decision on a watch. I cannot tell how many pieces that I liked based on images on the Internet that I did not like in person and visa versa. It came down to 6 beautiful choices, all of which would have been a pleasure to own. All of these watches were to my aesthetic liking (that's why they were finalists) and all had some minor but livable "flaw" to them. The livable flaws were that the ALS and VC were classic in their dial designs, but a bit sterile; the PP was classic but was somewhat anonymous and ubiquitous in its look; the Breguet had a date window that was located quite close to the chapter ring; the GP was a bit large and has a disproportionally small calibre and the GO was not by design "timeless" in its aesthetic. This after some consideration eliminated the GO from the mix. I was not looking for a period piece, despite my liking of its design. From a movement design perspective, the Breguet and the PP with their free-sprung balances, to me; stood out to me above the rest. The Breguet also had some novel high-tech materials and surface finishes (silicon, DLC etc.). Some people view new technologies as unproven liabilities particularly with respect to long-term reliability and serviceability; but I felt that the silicon technology between Breguet, Omega, PP and UN had been field tested at this point and the risk-benefit weighed out on the positive. The balance and escapements on these seemed superior to the other four movement choices. Both the ALS and VC were very traditionally designed; each in their respective regional Saxon and Geneva schools. From a finish perspective, the ALS, Breguet, PP and VC were all beautifully crafted, each based on somewhat different traditions. The GP, while a very nicely crafted and robust calibre (a very efficient winder) was a "notch" less finished than these four when looked at in detail under a loop. Other than the GO, the other five choices all were new brands to my collection. My collection by country of origin had a German single watch, two- Swiss-German, and five Swiss watches so there was no real differentiator there. Four out of the eight watches had date functions and four did not. Six out of the eight watches in my collection had small seconds and only two had central sweep seconds (BP and IWC). So both the Breguet and the PP had central seconds, but the Breguet (and the GP) brought an enamel dial to the table (the GP did as well). So I felt that center vs. small seconds' was the most significant differentiator stylistically. Well PP and VC were both considered premier watch ateliers both historic innovation and from a quality perspective, with PP having the current aura of "Numero Uno" amongst the collector world. ALS, a perennial favorite among watch enthusiasts was well regarded for its outstanding craftsmanship and movement innovation over the last 15 years. Breguet, while acknowledged as making very high quality watches were considered somewhat of an artificial corporate creation of the Hayek's. 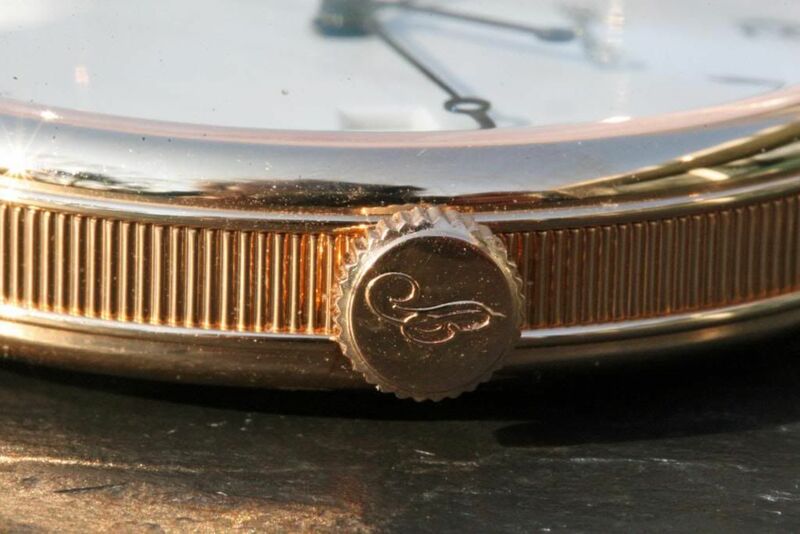 GP was well respected, historic "sleeper" brand, not spoken about as much as their watches merited. So a collector might say get the "PP" or the "VC" and a watch enthusiast might like the ALS for its craft. All of these companies were stable and will be around for the foreseeable future so there was no difference there. The Breguet and GP would always be viewed by a collector at the next lower subjective tier of horological hierarchy, because of a lack of continuous history or authenticity in the case of Breguet or a slightly lower level of finish on this (key word) GP. After some reflection, I decided that this sort of hierarchal provenance was both fugitive and subjective and should NOT factor into a decision as to which watch to choose. These six watches ranged in price by a factor of 2x relative to each other in this order from high to low PP>GP>ALS>Breguet>VC>GO. Really, the middle four were all quite close in price. For a purchase like this, I decided to take this off the table as well; because I had the money to afford any one of these choices and to not regret the decision years from now that might have appeared penny-wise and pound foolish. Again, I decided focused on the attributes of the watches themselves. Aesthetically, I could make a case for any one of them except the GO, which in the end, while beautiful; is a period piece by design (hence the name 60's). The GP also a period piece by name had more of a timeless aesthetic to it. From a movement design perspective, the Breguet and the PP won the day with their free-sprung balances. The ALS, Breguet, PP and the VC were all impeccably finished so to me there was no differentiator there between them. 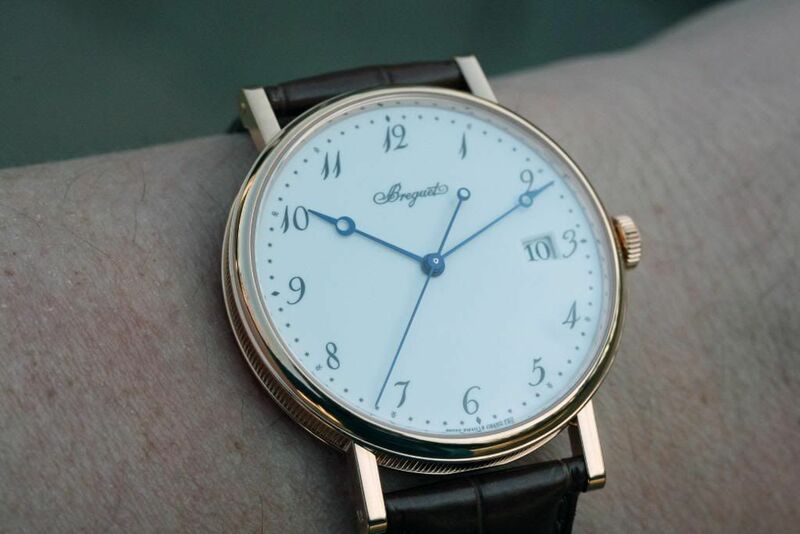 Both the Breguet and PP were both new brands with central sweep seconds, but the Breguet had the novelty of an enamel dial. So in the end movement design and collection diversification were in the end the differentiators between these choices. The answer for me was the Breguet. The case is made from polished, 5N rose gold. 5N rose gold has a higher percentage of copper than 3N and 4N rose gold (12%, 16% and 20.5% copper respectively) which is used by some makers today . All are marketed as "pink" or "rose" or "red" gold, because yellow gold has only 6% copper typically. After looking around in the shops, I found that I preferred the redder hue of the 5N alloy. The case is classically sized at 38.0 x 8.8 mm, which while large by historic standards, is small relative to plethora of 40 mm watches that seem to be the standard of today, by many makers. It has a simple and narrow, polished bezel and the watch are visually dominated by the enamel dial and wears larger than the numbers might suggest. The case band fluting (fine grooves enhanced with double beading) adds visual interest to contrast the plain dial. The fluted pattern is cold-rolled into the case band then finished by hand on a mechanical work piece-holder. The case back is engraved and has a sapphire display back to see the calibre within. The lugs are thin and are finished with screw pins and the fluted crown is decorated with a raised company logo. The dial is made from grand feu enamel or high-fire enamel in English. It is simple, white dial with hand painted Arabic numerals and subtle and diverse chapter ring symbols. 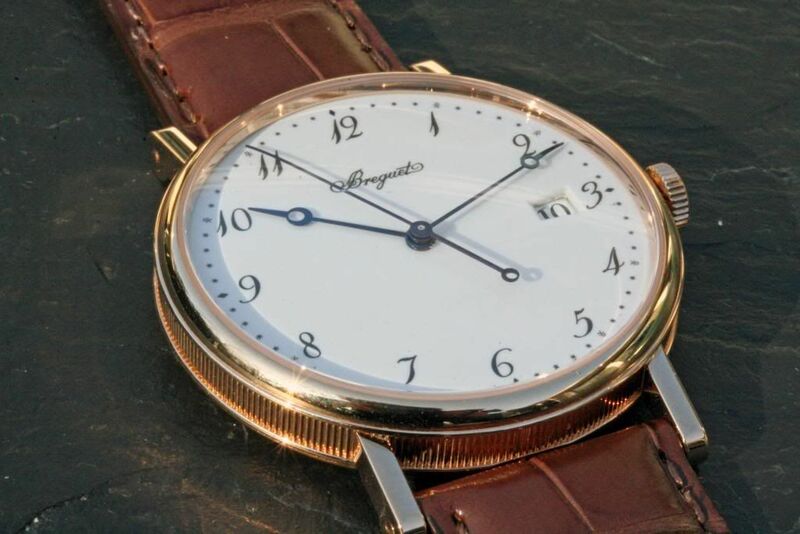 The hour, minute and second hands are done in Breguet's signature blued eccentric moon tip. The hands are sized to reach the corresponding symbols on the chapter ring perfectly for easy reading A trapezoidal date window is located adjacent to the 3 o'clock. Post-Swatch Group Montres Breguet has developed a reputation among watch collectors for being a bit surreptitious regarding declaring the origin of the movements housed within their watches. While all are very nice movements; many are either historic Nouvelle Lemania (pre-Breguet) or Frederic Piguet (Blancpain) movements that are used by other watch brands. These are very fine movements but in a collector's World driven by exclusivity and its use of vague product literature have created a "bad taste" among collectors. The Calibre 777Q housed in this watch was commissioned by Mr. Hayek Sr. to Montres Breguet (Lemania) in 2001 shortly after the purchase of both companies (Breguet and Nouvelle Lemania). So it is a 100% in-house automatic base calibre used exclusively by Breguet. The movement was introduced by Breguet five years later at Baselworld 2006. It is a 12 ligne, 26 jewels, single barreled, automatic calibre that winds with counterclockwise rotation. The watch operates at 28,800 bph and has a 55-hour power reserve. The barrel is coated with DLC to reduce friction and provide a more consistent power curve. 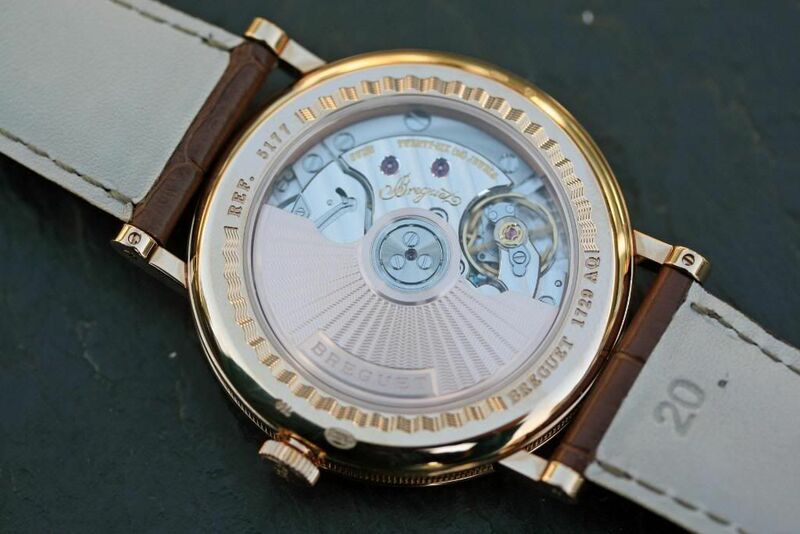 An 18 carat, 5N rose gold rotor decorated with guilloche and rotates on ceramic bearings to provide winding power. The balance is free-sprung, with four adjustment weights and incorporates a new Nivaroc-FAR shock protection system (also used by Omega I believe) called Nivashoc® that is supposed to allow for better centering of the balance pivot than Incabloc. The movement's balance is coupled to a Anachron® Breguet over-coil hairspring for superior isochronism. Both the escapement wheel and Swiss straight lever are fabricated from silicon to reduce friction, mass and magnetic sensitivity. The movement is finish is understated, with both Cotes de Genève striping and perlage decorating surfaces. The bridges are hand finished with anglage, and are rhodium plated with gold engraved gilding. The screws are chamfered and black polished as is expected in a finely finished movement. 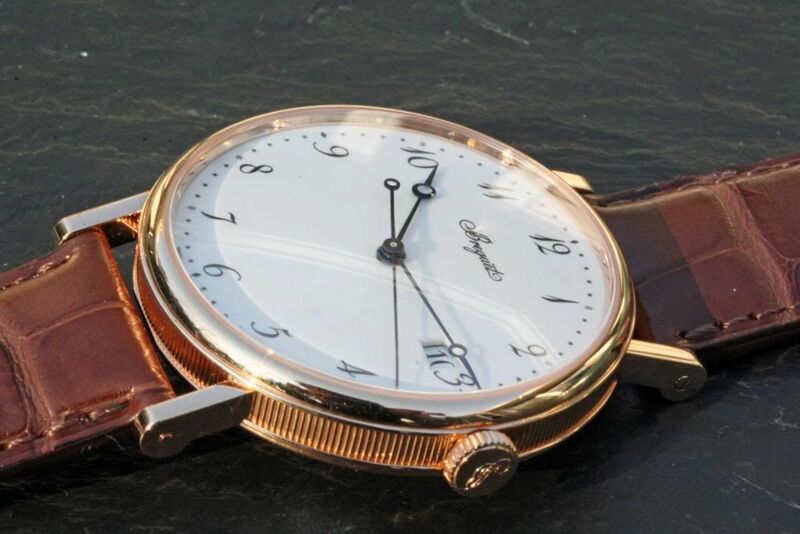 A well crated 20 mm x 18 mm, dark brown alligator strap to contrast the rose gold to complement the hue of the case with an 18 carat 5N rose gold clasp. I will take some more shots when I get a chance this weekend. Sorry about the long post; I didn't have time to write a short one.